After a long day of teaching, Jesus Christ boarded a ship with His Apostles. They were going across the Sea of Galilee to teach the people on the other side. Christ was asleep when a storm came upon them. 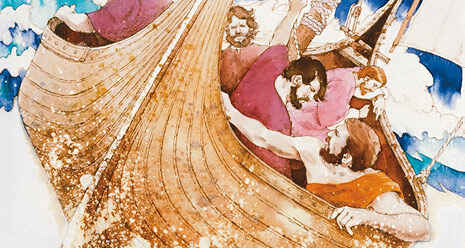 The Apostles began to fear the storm as they were tossed by the winds and water filled their boat. They awoke Jesus, crying, “Master, carest thou not that we perish?” (Mark 4:38). Christ arose and calmed the winds and waves with His power, saying “Peace, be still” (Mark 4:39). He turned to His Apostles and asked, “Where is your faith?” (Luke 8:25). Christ gently chastised them for being fearful and not remembering that He can calm the tossing seas during a storm. I recently heard a friend say that “life is a storm sometimes.” How true that is! Life can be tempestuous, tossing us with winds of misfortune, grief, shame, or stress. Christ not only calms the physical seas, but He can also calm the seas within our minds and souls. Do we call on Heavenly Father and His Son when the waters of anguish begin to fill our ship? Do we have the faith to trust in Christ? It’s hard to remember there is someone who can bring peace when we are being tossed so hard that we feel like we can barely hang on. Sometimes in life we just try to outlast the storm, forgetting to call on the One who can calm it. Peace may not always come as it did that long-ago day on Galilee﻿—the storms and winds may not be replaced by perfect calm. Instead, when we hasten to call on the Master and allow Him to bear our burdens, our peace may come in small reminders of His love and care, giving us strength to get through the storm. My storm may not have been as tempestuous as the storms others face, but it is not the velocity of the storm that makes our Heavenly Father and Jesus Christ willing to help us. It is our faith in Christ’s calming power and our hastening to call for His help that allows Him to calm our hearts during life’s storms. Elder Robert D. Hales of the Quorum of the Twelve Apostles, “Faith through Tribulation Brings Peace and Joy,” Ensign, May 2003, 18.